Terminus originally aired in 1983. It was the second instalment in the Black Guardian Trilogy. If ever you had to kill someone, could you do it? Could you? No. I don’t know. If it was important, to save my friend, to defend myself. – Turlough does seem to “get” Tegan, does he? Terminus gets a bit of a bad wrap, and I can understand why. It’s a very “eighties” production, in all the wrong ways. There’s too much soap opera, there’s bad acting, there’s a wealth of high concept ideas that are never properly exploited, the monster looks absolutely terrible, and the budget shows in the worst possible manner. Still, despite all these (very significant) flaws, I still kinda like it, admiring the story more for the ambition than for the execution. Terminus was one of those “cursed” Doctor Who productions that you read about from time to time, where various external factors ate into the quality of the product appearing on screen – much like many of the problems that dogged Warriors of the Deep, and which killed Shada. While it might be interesting to imagine what might have happened if things had gone smoothly, it ultimately changes relatively little. Let’s start with the worst aspects of the production. The supporting cast is generally terrible. There is one reasonably “okay” member of the guest cast (Peter Benson as Bor, the Vasil suffering from radiation poisoning). The rest seem to be sleepwalking through the adventure. Hell, even a nice scenery-chewing performance might have helped to inject a bit of life into proceedings. Instead, there’s now reason to really care about any of the people caught up in the plot. "We've landed in the future... eighties-style!" I should also note that the costuming is fairly crap as well. I know that the infected are meant to be stand-ins for lepers, but it’s weird that they seem to clothed in rags (as opposed to wearing clothes that become rags). Even when Nyssa is infected, they seem to give her a (clean!) set of rags to wear. It just feels kinda silly. Speaking of silly, what the hell is with the white jumpsuits (and capes) that Olivar and Kari are wearing? It looks like they’re a glam rock tribute band, rather than a bunch of raiders. The Garm itself, the “monster” of the episode, looks absolutely silly. I know it’s not meant to be evil, but it should probably look more threatening. As it is, it looks like the type of mascot you’d see at Disneyworld. There’s something absolutely hilarious about the way that it waddles, especially when Valgard chants, “Quickly!” It actually reminds me of a guy in a Santa suit, pottering along at his own pace while the episode takes place around it. Given that it hasn’t been that long since we’ve seen the Mara, to say that the Garm looks ridiculous is quite a sweeping statement, but I’m not afraid to make it. “No! What is that thing? !” Nyssa asks when it appears, more befuddled than horrified. On the other hand, I’m not sure if I like or dislike the uniforms that the Vasils wear. The suit of armour modelled after bones is quite impressive, but I can’t figure out why the helmet has a moustache. I’d like to pretend that Tom Selleck is something of a religious deity to these people. But then they’d have to replace the skeleton armour with Hawaiian shirts, so I’m not convinced that it’s the best course. In fairness, the outfits don’t look terrible – which isn’t great, but it’s a huge improvement over the Garm. "You dare question our moustaches?!" 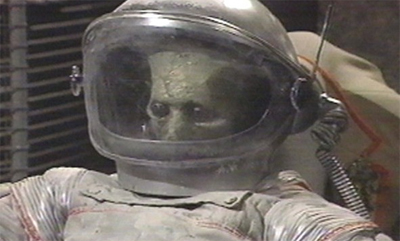 It seems to be a statement on the part of the producers, as the series is growing gradually darker and just a bit more sinister – Eric Saward’s influence would push the following season towards grim nihilism. Replacing Adric (a know-it-all stand-in for the younger fans) with Turlough (a sinister (apparently) child soldier plotting to kill the Doctor) is a fairly clear statement of intent, and perhaps an indication of the direction the show wishes to go. The following years would grow increasingly violent, and I think that the tail end of the Davison era was when the show really swung in this direction. The adventure also suffers a bit from what was the main problem with Mawdryn Undead. There are too many elements competing for space. Terminus has a wealth of great science fiction ideas, but perhaps too many of them, which means that none really get the opportunity to shine and develop properly over the adventure’s runtime. One wonders if they might have been better to cut one or two of them for the sake of the serial as whole. And then there’s Nyssa’s skirt. I get that she’s supposed to be stripping off because she’s feverish, but it doesn’t really come across that well on-screen. 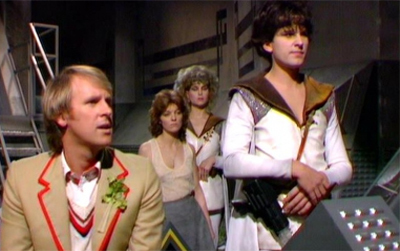 Instead, even the Doctor seems perplexed by this (“Nyssa’s skirt? !”), which is quite understandable. A lot of people accuse Sutton of being quite wooden, but I generally felt that she did the best possible with the material afforded her. On the other hand, way to overshadow the rest of the serial, Sutton! In fact, you’d swear this was the only thing that happened for the entire four-part adventure. In fairness, a lot of these are good ideas. A critique of privately-run medical care would have been quite timely, and there are shades of that in how “Terminus Inc.”are portrayed. While we see all the evil antics that the private corporation gets up to, shipping lepers and using prisoners as slave labour by regulating a drug they’re addicted to, there’s very little bite to all this. The corporation is entirely faceless, which is arguably appropriate given the theme, but it means that the Doctor and the Vasils never get a chance to engage directly with a corrupt system, they just passively work within it, almost. In fact, the end of the serial completely handwaves the possible complications that meddling with the company might create, with the Doctor basically stating that they won’t respond in any way to the Vasils’ act of rebellion. Although I do quite like the automated announcement system on Terminus. Given Steven Moffat’s fondness for the era, I can’t help but wonder if it might have inspired some of his later writing. Although it’s hardly used to best effect, there’s something very ominous and atmospheric about the automated server announcing, “There is no return. This is Terminus.” That’s pretty foreboding, and it’s easy to imagine that being loudly repeated several times as the lepers surround the Doctor and his companions before the cliffhanger sting sound. Indeed, there are quite a few elements here that might actually be recycled and put to good use in the new series. There’s also the “Event One” element, where an explosion on Terminus apparently went back in time and caused the Big Bang. In theory, it’s an interesting idea, but it doesn’t really work. “But exploding fuel in space?” Kara asks. “It’s almost too simple.” That’s not really the problem with it at all. The problem is that it’s been lamely shoehorned into an overcrowded episode so that the threat this week might destroy the entire universe, which is a ridiculous cliffhanger that even Russell T. Davies might have stopped just short of. Davison is as reliable as ever, even if his guest cast are beyond terrible. The way he deadpans “I’d appreciate some help” as he’s being strangled or “look, whoever you are, we haven’t got time for this” when a gun is pointed in his face is priceless. In many ways, it seems like Davison is practicing for Warriors of the Deep, and – to his credit – he never seems bored or disinterested, instead giving the whole adventure all the enthusiasm that he can muster. It’ll be good to see the Tardis again. Yes… well… it’ll be nice to know she’s safe. Tegan! I was trying to reach you. Turlough went back to the Tardis on his own. I told you not to follow me! Doctor! Say you’re pleased to see her. Yes… well… I’m pleased to see her – but she shouldn’t have followed us! I think that conversation really captures the dynamic perfectly, without ever becoming too much like a soap opera. 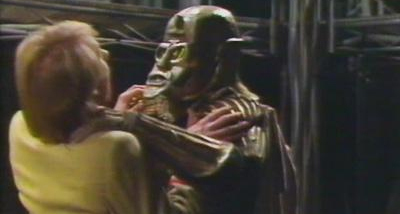 It’s a fond farewell to Nyssa of Trakken, which is really something given everything else that is going on around it. I should also take the opportunity to remark on the new special effects that the Doctor Who Restoration Team have put together for the release. On Mawdryn Undead, they did look a little tacky. They aren’t entirely convincing here, but they’re much better (it helps that there’s more darkness). I do love that the effort was made, and it is wonderful that they put the effort in – it does illustrate how much of a difference something as minor as bad special effects can make. In fact, the entire Black Guardian Trilogy has received rather wonderful treatment from the folks at 2 entertain – there are wonderful extras and special features and documentaries. I know every collection is great, but this is a rather wonderful one. Speaking of The Black Guardian Trilogy, Terminus feels strange because it doesn’t really advance the on-going plot involving Turlough and the Doctor. “The Doctor still lives!” the Black Guardian remarks, as if frustrated his subplot has to wait behind the one featuring the Garm. Beyond the over-long opening scene and a few exchanges between Turlough and the Black Guardian, it doesn’t really go anywhere, but eats into the serial’s runtime. It doesn’t help that the serial doesn’t really explore the same themes of eternity and immortality that tangentially connect Mawdryn Undead and Enlightenment, making the adventure feel even more like the odd one out. Terminus isn’t quite as bad as most people would have you believe. There’s a few interesting ideas here, buried beneath bad performances and an overcrowded script. It’s a shame, because there are some great ingredients here, and one gets the sense there was a great story waiting to be told, if circumstances hadn’t been against it. It wasn’t the pilot’s decision. The computer’s just started an automatic sequence to jettison the unstable fuel. If we don’t do something quickly, the whole universe will be destroyed.